Rozella Harvey thanked P.G.E. lineman and Estacada Telephone and Telegraph "for the wonderful work getting the power and phone service working during the recent windstorm." The Christian Ladies Circle expressed their gratitude to residents of Estacada and the surrounding areas for their recent purchases of tamales and other novelties during a recent event. "It is greatly appreciated and without your purchases it would not have been a success," they wrote. "We made 659 tamales and all were sold." Norm Christensen, chairman of the Estacada Timber Festival, delivered the city's 40-foot Christmas tree. 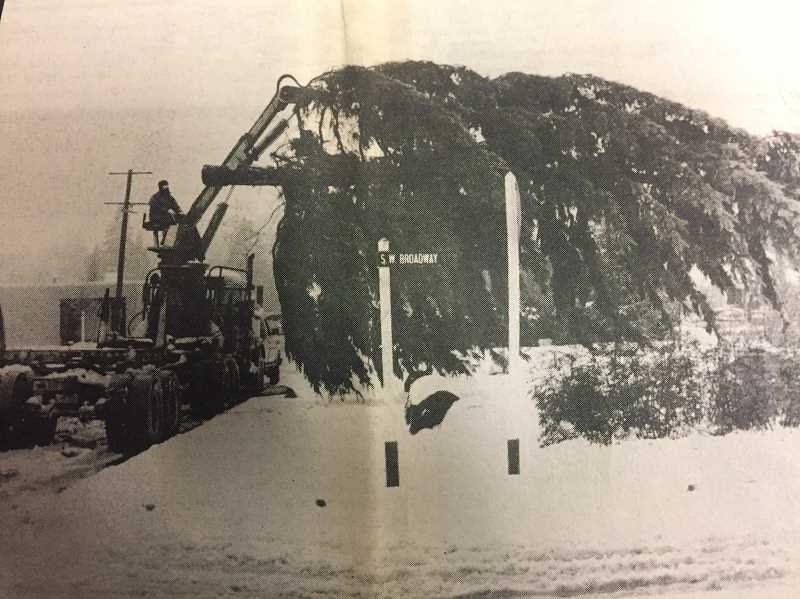 "Norm cut the tree on the Timber Festival grounds, loaded it and then re-loaded it when his log truck got stuck in the snow," The News reported. "Strong winds blew the tree over Friday morning. Christensen then attached additional support cables to assure that the tree would remain vertical." The newspaper featured this quote from Red Buttons: "He's a real loser. He moved into a new neighborhood and got run over by the Welcome Wagon." The Estacada Boosters Club had recently donated two electronic scoreboards to be mounted in the Estacada High School gymnasium. The high school's previous scoreboards, which had been installed 27 years earlier, would go to the Junior High School. More than 100 Estacada area residents would soon participate in the annual Festival of the Choirs. During the fourth annual event, participating choirs would include the Springwater Presbyterian Church Choir, the Estacada United Methodist and Eagle Creek Presbyterian Combined Choirs, the Estacada Seventh-day Adventist Church Choir, the Church of Jesus Christ of Latter-day Saints Choir, the Estacada High School Concert Choir and the Estacada Community Chorus. The Estacada Community Center facilitated a bus tour of houses decorated for the holidays in the Estacada area. The evening began with supper at the Country Restaurant and Lounge, followed by an exploration of brightly-decorated Estacada neighborhoods. The bus tour cost just $3 per person. can post any openings they have.